We worked most of the day yesterday and got to a reasonably good place, but not as far as we wanted. Noel took down the picture rail, which turned out to be over three layers of wallpaper (it appears to date from after WWII) and was clearly not original. Also, it has a layer of grey battleship paint on it which means it has to go: that stuff does not strip off and it loaded with lead (not that that is a huge problem at ceiling level, but you know). 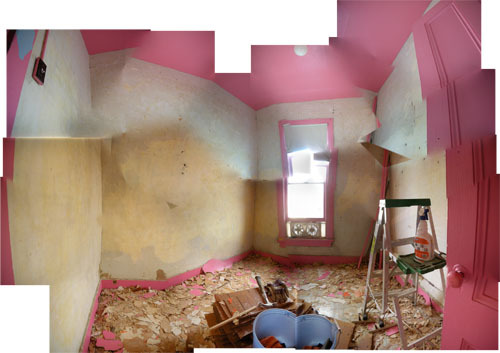 We got all the remains of the wallpaper off, and worked on stripping off the layer of wallpaper paste, used as a sizing, over the plaster. Where the walls are grey, there is paste; the yellow is the original paint colour (and, coincidentally, close to the colour we were planning to paint this room). Fitz asked about hints for removing wallpaper from plaster, so here are some more details. 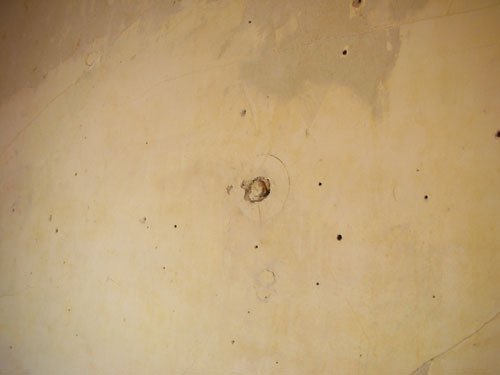 To begin with, removing wallpaper from plaster is much easer than removing it from drywall. 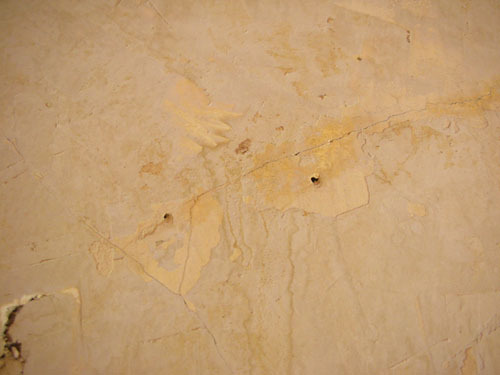 Plaster has a nice smooth surface and scrapes clean, and can be washed without making a huge mess. Not so drywall, which has that layer of paper on it and is a bit softer. I find it useful to sharpen the edges on these regularly while working, because the scraping dulls them. We also use wallpaper paste dissolver. You can use a steamer, but those are very heavy and hot and I always burn myself with them, plus renting them can get expensive if you work slowly. When you have any layers with paint on them mostly scraped off, you can spray this dissolver on the wallpaper and it will loosen things up to make it easier to scrape. 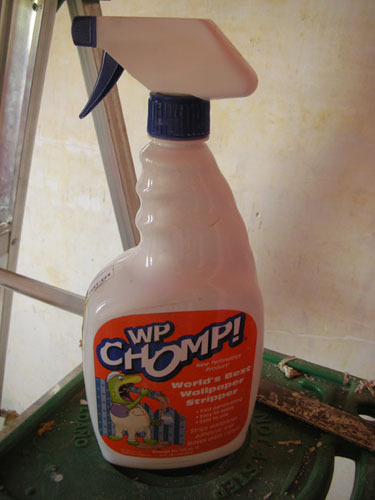 When there's a patch that's very firmly stuck to the wall with paint on top, I will sometimes spray this along the edges to loosen it up. Most old wallpaper comes up fairly well, especially if it is sagging to begin with, as all ours is. If it seems really stuck, the hardware store will sell you a little piercer tool that you roll over the wall to poke holes in the paper and allow it to absorb steam or dissolver. The real pain is cleaning off the wallpaper paste underneath. On our walls there is almost 1mm of paste under there, and you can't paint on it (well, you can but it will shed the paint). In this photo you can see where it has flaked off to show the wall underneath. To deal with that paste, I use a two-pronged approach: warm water sponged or sprayed on with scraping, then scrubbing. The paste comes off more easily when it is moistened, so first I either sponge it or spray it with plain warm water (by this point we've got a bunch of empty bottles from the paste remover so I use one of those), then scrape off the majority of the stuff. If you don't already have a ton of loose wallpaper shreds all over your floor by this point, you want to put down a dropcloth, because this is messy. When you've mostly scraped it off, use warm water and a scrubby sponge (I like the ones that are sponge on one side and scrubber on the other) and scrub the rest of the paste off, wiping down as you go so you can see where you've been. You can scrub it all off but that means a lot of trips to the sink to change the water. Even if you don't have handy paint underneath to let you know when you're done, you'll be able to tell by the texture of the wall. And if you wash with a TSP substitute before painting, that will remove the last remnants of the paste. For us, the next big fun after we finish the paste removal (IF we finish the paste removal) is repairing the plaster. You can see that there was a particular level on the wall where people liked to hang pictures. And this little belly button is the old gas lamp pipe, which is a little proud of the wall and might take some real work to cover up. But for now? We scrape. Thanks for the details, Ayse! I doubt the layer you mentioned is actually only wallpaper paste - it could be distemper, paint mostly consisting of powdered chalk and wallpaper paste, due to the chalk of course resulting in noticeably thicker layers. While it lost its popularity in the US long ago (I still haven't figured out what people love so much about paints almost impossible to get off the wall without taking down the plaster, ok, they're washable, but that's it) it's still fairly common in parts of Europe since it's the cheapest wall paint available, easy to use, easy to remove (both from the walls and tools you were too lazy to clean) and absolutely environmentally friendly. And once you get tired of it you take some water and scrape it down to repaint (if you don't wait 20 years between coats but repaint every 5 years as "decent" people once used to do here you can even paint over it, otherwise it'll bubble and peel off once it gets wet again). Oil based paints were only used for wood and in lieu of tiles in kitchens and bathrooms here. Well, given that a) there are a couple of layers of some sort of actual paint under the layer of wallpaper sizing, b) that that was how a local conservator who knows what was used in these houses identified the stuff, and c) that it would have been applied in the late 19thc./early 20thc. when distemper was out of use in the places where it was used commonly (which did not include this area), I very much doubt it is anything like that. 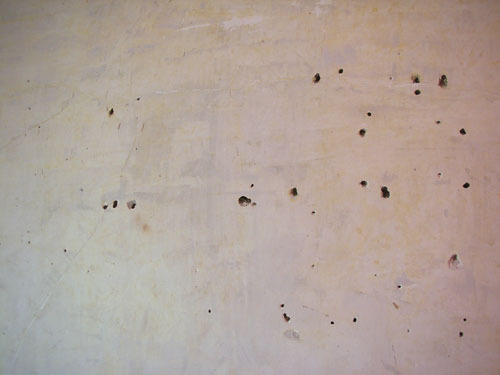 Also, it doesn't flake off like old distempered walls, more's the pity. Otherwise I would not be spending multiple days scraping and scrubbing it off the walls: it would just come right off with a quick scrape. The thing that's nicer about paint than, say, wallpaper, is that when you want to change the colour of the room you just sand it a bit and repaint. It takes a heck of a lot of paint to build up to a noticeable level on a wall, and then you can just sand down to a smooth wall if it's a problem. I don't care for thick wall coatings like distemper because I don't want to have to do a major cleaning project every time I repaint. 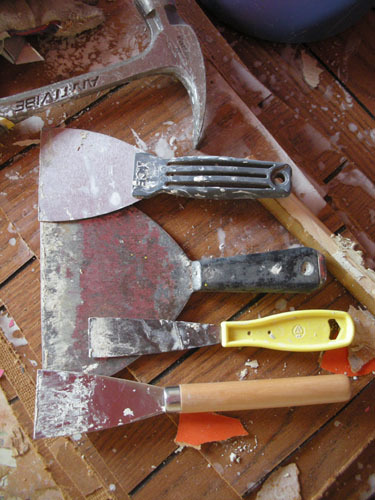 Also, they really don't work nicely with drywall, which we are using to replace our plaster (for earthquake safety). Sounds like you're right about the paste - additionally there was a thing called "Rollmakulatur" in German, a paste applied to the wall prior to papering in order to smooth it out and make the paper adhere better. I had some fairly "nice" experiences with oil paint (I assume old linseed oil paint) applied to plaster walls and it made me swear never to use it - half of it was flaking off in big chips, but the other half was clinging to the wall so I ended up tearing down and replastering. Of course, drywall and distemper don't mix well - but living far from earthquake zones I never even considered that. Sounds reasonable in your case though.